Dr. Maksoud is board certified in four specialties: Pulmonary Medicine, Critical Care Medicine, Sleep Medicine, Internal Medicine. Pulmonary and Critical Care and Sleep Medicine fellowship was completed at Baylor College of Medicine in Houston in 1997. His Honors included being designated chief fellow in his third year. He did his Internal Medicine residency at the Cleveland Clinic Foundation in Cleveland, Ohio. Dr. Maksoud worked for two years in Emergency Medicine at Montgomery General Hospital in West Virginia from 1992 to 1994. He went to medical school at the American University of Beirut, Lebanon. He has been in private practice in Southeast Houston since 1997. Dr. Maksoud held many positions on different hospital committees, in several hospitals. He chaired the Southeast Houston Harris County Medical Society in 2001. Dr. Maksoud is one of the Founders/owners/directors of Clear Lake Sleep Center. Staying at cutting edge of medicine, Dr. Maksoud was the first to do Ultrasound bronchoscopies in Southeast Houston in 2012. 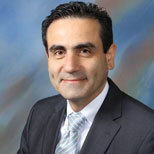 Dr. Maksoud was also the first to do Bronchial Thermoplasty as a treatment for asthma in Southeast Houston, in 2013.